One game -- one highly emotional, incredibly hyped, "historic" game -- doesn't mean anything over the course of an NBA season. (Well, it has some meaning, since it technically counts towards overall record, but relatively speaking, it don't mean jack.) And yet we must acknowledge one wacky fact about the star-studded 2014 Cleveland Cavaliers: They now have as many home losses this year as this same franchise did the entire 2008-2009 season. Only LeBron and Anderson Varejao remain from 2008; Mo Williams has been replaced by Kyrie Irving; Delonte West replaced by Dion Waiters; Zydrunas Ilgauskas or Wally Szczerbiak replaced by Kevin Love (and yes, I chose those two guys for a reason). Obviously, the talent-level of this year's team, on paper, far surpasses what LeBron had to carry to Eastern Conference supremacy six years ago. And yet, that team was absolutely dominant at home (and no slouch on the road either -- they finished first in the East with a 66-16 record), thanks to chemistry. Those guys had played together for years at that point. Big Z and Varejao had been LeBron's big men since the King came into the league; West had been his point/shooting guard the year before; Mike Brown was his experienced coach. That familiarity and friendship (remember all their little pre-game antics and rituals?) helped them nearly run the table through 41 home games. 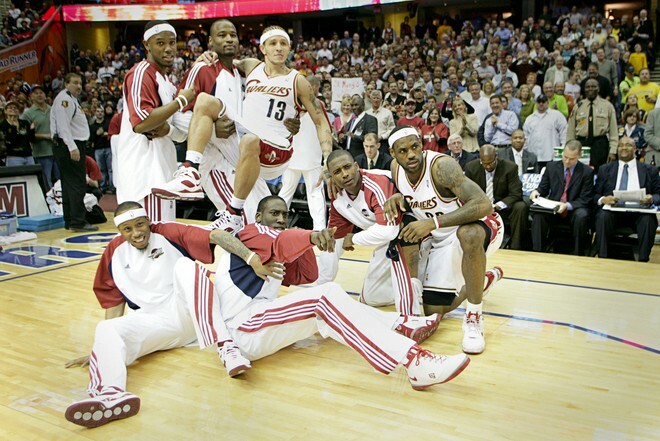 Will this year's Cavs eventually have that same camaraderie? Tough to say. But it's clear that talent alone can't carry a team. That's why the Miami Big Three went 9-8 to start their first campaign together. Winning takes talent, but it also takes trust, and it's obvious that the Cavaliers trail even the dysfunctional Knicks in that regard to start the season. If LeBron is still turning the ball over eight times a game in February, then we can talk. Until then, chalk this one up to growing pains.